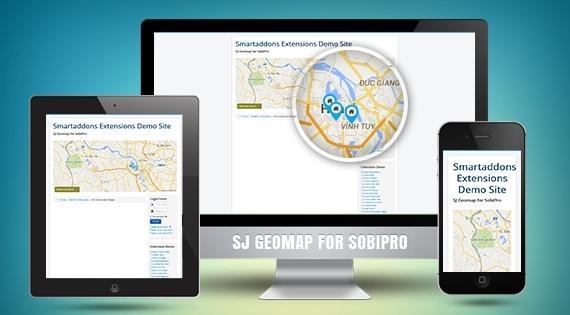 SJ Geomap for SobiPro - A distinguished responsive Joomla Module for SobiPro component. SJ Geomap for SobiPro module works with SobiPro entry's fields. It allows users to search the SobiPro entries according to their criteria such as: price, city, country or any keywords that users enter. The search result will be shown as icon on Google map. When clicking on the icon, it will display the entry's information: image, title, description, price, readmore link... In order to search and get accurate results, you have to create proper and sufficient information for SobiPro's entries. SJ Geomap for SobiPro comes with an easy-to-custom backend that allow you totally control any module parameters as well as quickly configure it as your wishes. You can place it on a highlighted position to effectively impress your website. Now, let's take a preview on it. You will love it at first sight.